Piggy banks are not just a toy in which kids deposit their money. They are a valuable tool for teaching numerous life-long concepts about money management. 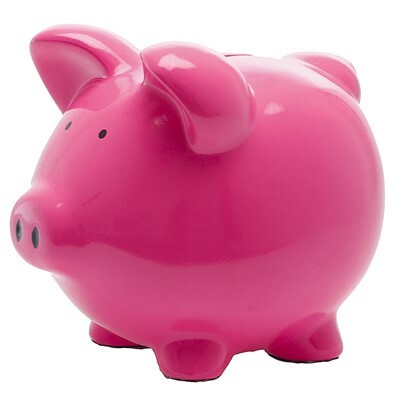 Piggy banks are not just a toy in which kids deposit their money. They are a valuable tool for teaching numerous life-long concepts about money management. Beginning at the age of 4, children can learn basic financial concepts to lay the foundation for making good financial decisions for their future. - Identifying (and perhaps sorting) different coins by shape, color & size and the bills by pictures and numbers – and talking about them before dropping them in the bank. And soon your child will be able to identify them by themselves. - Giving them an opportunity to save money – to purchase something for themselves or for a gift, to give to a charity or add to their own savings account. As money is added to the bank daily, weekly or monthly, they are opportunities to begin discussions on everything from saving for a toy purchase to making a philanthropic donation. - Sharing the value of earned money by rewarding youngsters for a completed household task, allowance or rewarding another agreed upon responsibility. A discussion can highlight the concept of exchange – either a monetary exchange or perhaps a non-monetary exchange. And identify how values are determined by reviewing the difficulty or complexity of skill-sets, length of time it takes to complete a task, the cost of materials needed for the job, or other important factors that need to be considered. - Discussing the difference between wants and needs. One being something that may be fun and desirable like a toy, or the other being necessary – food, clothing and a place to live. Discussing these concepts will help a youngster expand their focus from thinking about today to thinking about tomorrow and the future. Ideas that reinforce planning are the basis for moving from instant gratification (cheap toys or candy) to reaching targeted longer-term goals (a purchase that requires saving).